12.33pm: Here's a lunchtime summary. • Gaddafi forces have retaken the town of Brega and are shelling Ajdarbia, 90 miles from Benghazi. Rebel forces plan to make a stand there, the last major obstacle to Gaddafi before Benghazi. • Bahrain has declared a state of emergency. A Saudi soldier has been shot by a protester in Bahrain. A 1,000-strong force from Saudi Arabia and other members of the Gulf Cooperation Council arrived in Bahrain yesterday. • Libyan government troops have captured Zwara, the last rebel-held city west of Tripoli to fall back under government control. Jauns pagrieziens, šai lietā - Saudu Ārābija ievedusi karaspēku Bahreinā. Jauki. • Gaddafi's forces have continued to attack opposition-held territory in Libya. The city of Misrata, 200km east of Tripoli has been bombarded by Gaddafi's forces using tanks and artillery witnesses told Reuters. A doctor at Misrata hospital said 11 people were killed. They have also been shelling Ajdabiya nonstop, the Associated Press reports, which indicates that the rebels have not been completely driven out of the city, which is only 90 miles from Benghazi. • The UN secretary-general, Ban Ki-moon, has called for an immediate ceasefire in Libya. He is said to be "gravely concerned about the increasing military escalation by government forces, which include indications of an assault on the city of Benghazi". Meanwhile, the UN security council continues to discuss the prospect of a no-fly zone. The US said there could be a vote on the draft resolution tomorrow. • Saif al-Islam Gaddafi has told French TV that the fighting will be over in 48 hours, while pledging that the regime will not take revenge against the rebels. • The Guardian reporter, Ghaith Abdul-Ahad, who was detained by the Libyan authorities two weeks ago, has been freed but four New York Times reporters in the country are missing, according to the US paper. • Six people have been reported killed in Manama after Bahraini military troops launched a large-scale assault against hundreds of anti-government protesters occupying Pearl Roundabout, the focus of demonstrations over the past month. There were reports of the military occupying the Sulimanya hospital and beating medical staff. • The use of force against protesters in Bahrain has attracted international condemnation, including rare criticism from the US of its Gulf allies. Secretary of state Hillary Clinton described events in Bahrain as "alarming" and said its Gulf partners which had sent troops in to support the Bahraini government were "on the wrong track". Iraqi and Lebanese Shias demonstrated in solidarity with the protesters in Bahrain. Iranian president Mahmoud Ahmadinejad and the Iraqi prime minister Nuri al-Maliki also criticised the crackdown. • At least 150 people were wounded when Yemeni security forces tried to break up an anti-government rally in the Red Sea city of Hudaida. A doctor treating protesters at a sit-in in Hudaida said hundreds of security forces and plainclothes police, all armed, attacked the demonstrators. • A Syrian human rights organisation said security forces arrested 25 people who were part of a demonstration demanding the release of political prisoners in front of the interior ministry in central Damascus. Witnesses said security forces beat some of the protesters. For a brief, happy period on Friday, it seemed that the United Nations security council resolution adopted in New York the previous evening had actually stopped Muammar Gaddafi in his tracks. To general surprise, the Libyan dictator announced an immediate ceasefire, prompting relief and joy among the inhabitants of the besieged rebel city of Benghazi. The commitment by David Cameron, Barack Obama and French president Nicolas Sarkozy to use "any necessary means" to halt Gaddafi's onslaught on his citizens had achieved immediate results. That euphoria did not last long. Exactly eight years after the US and Britain invaded Iraq, the west is involved – this time with the support of the Arab League – in another deadly and unpredictable military confrontation with a dictator in the Middle East. The US, Britain and France pounded Libya with Tomahawk missiles and air strikes into the early hours of Sunday, sparking fury from Muammar al-Gaddafi who said the Mediterranean was now a "battlefield." United States and British forces fired at least 110 Tomahawk cruise missiles at Libya's air defence sites on Saturday, a top US military officer said, two days after a UN Security Council resolution with Arab backing authorised military action. An AFP correspondent said bombs were dropped early Sunday near Bab al-Aziziyah, the Tripoli headquarters of strongman Muammar al-Gaddafi, prompting barrages of anti-aircraft fire from Libyan forces. State television had earlier said hundreds of people had gathered to serve as human shields at Bab al-Aziziyah and at the capital's international airport. A Libyan official told AFP that at least 48 people had died in the assaults, which began with a strike at 1645 GMT Saturday by a French warplane on a vehicle the French military said belonged to pro-Gaddafi forces. Gaddafi, in a brief audio message broadcast on state television, fiercely denounced the attacks as a "barbaric, unjustified Crusaders' aggression." Libya's foreign ministry said that in the wake of the attacks, it regarded as invalid a UN resolution ordering a ceasefire by its forces and demanded an urgent meeting of the Security Council. The attacks on Libya "threatens international peace and security," the foreign ministry said in a statement. "Libya demands an urgent meeting of the UN Security Council after the French-American-British aggression against Libya, an independent state member of the United Nations," the statement said. On Thursday, the Security Council passed Resolution 1973, which authorised the use of "all necessary means" to protect civilians and enforce a ceasefire and no-fly zone against strongman Muammar al-Gaddafi's forces. The following day, Libya declared a ceasefire in its battle to crush an armed revolt against Gaddafi's regime which began on February 15 and said it had grounded its warplanes. As a result of the Western attacks, however, "the effect of resolution 1973 imposing a no-fly zone are over," the ministry statement said. State television, quoting a security official, said Libya had also decided to suspend cooperation with Europe in the fight against illegal immigration due to the attacks. "Libya has decided not to be responsible over the illegal immigration to Europe," the television cited the official as saying. Boats carrying thousands of undocumented migrants, mainly Tunisians, have landed on the Italian island of Lampedusa in recent weeks putting a heavy strain on Italy's immigration infrastructure. But with nearly 100,000 US troops fighting a protracted war in Afghanistan -- and with Saturday's missile strikes coming eight years to the day after the United States launched its war in Iraq -- Obama made clear that operation "Odyssey Dawn" would not send US troops to Libya. "As I said yesterday, we will not -- I repeat -- we will not deploy any US troops on the ground," he said. The first Tomahawk missile struck at 1900 GMT on Saturday following air strikes carried out earlier by French warplanes, Admiral William Gortney, director of the US joint staff, said in Washington. But British Prime Minister David Cameron said he held Gaddafi responsible for the situation in his country and that "the time for action" by the international community had come. "Colonel Gaddafi has made this happen. He has lied to the international community, he has promised a ceasefire, he has broken that ceasefire. He continues to brutalise his own people," Cameron told British television. In the rebel camp, celebratory gunfire and honking of car horns broke out in Al-Marj, 100 kilometres (60 miles) from Benghazi, to welcome the start of military operations against Gaddafi, correspondents said. Thousands earlier Saturday fled Benghazi as Gaddafi loyalists pounded the eastern city, the rebels' stronghold, with shells and tank fire after two early morning air strikes. Since Friday, the Libyan government has insisted it was observing a self-declared ceasefire. It said its armed forces had come under attack on Saturday west of Benghazi, including by rebel aircraft, and had responded in self-defence. Kā modernās Krievijas politikas pētnieks es domāju, ka šis karš ir īsta dāvana Krievijai. 49% ieņēmumi nāk no naftas cenām, kas tagad pateicoties karam Lībijā ir strauji pacēlušās. Tas uz kādu laiku ļaus Kremļa režīmam noturēties, pietam mēs jau nezinām kas var notikt Saūda Arābijā ja tur sāksies nemieri. Tādēļ Krievijas faktoru mēs atkal sāksim izjust. Krievija ļoti lieliski nodemonstrēja , ka viņai nav nekādas intereses sargāt Lībiju. Kaut arī viens Krievijas vārds varēja glābt Lībiju no šī militārā marazma. No otras puses, visa šī līdzjūtības izspēle ala Medevdevs pret Putinu, tas ir lielisks manevrs. Starp citu, Krievija zaudēja palielu militāro materiālu piegāžu kontraktu, kas tikai apstiprina ziņās par Lībijas militāro vājumu. Katrā gadījumā, pēc šīm pārs dienām raķešu apšaudes Lībijai vajadzēs pilnīgi jaunu pretgaisa aizsardzības sistēmu, - labs pārliecināšanas veids par labu pirkuma satura izmaiņu. Ko varam gaidīt - Sarunas par Kirēnes kalifāta izveidi. • The four RAF Tornado GR4s now based in Italy. Running costs are £35,000 an hour, once they are in the air. The Tornados fired Storm Shadow and possibly Brimstone missiles during their first two sorties, but the MoD won't say how many they used. Each missile costs £750,000 to £800,000. • The 10 Typhoon fighters also in Italy, more expensive because they are new. The cost to fly them is thought to be £70,000 an hour, though that may reduce to £40,000 an hour the longer the operation goes on. • The Trafalgar-class submarine HMS Triumph, which has been in the Mediterranean for more than a week. It has been firing Tomahawk cruise missiles at Gaddafi's air defence systems. Running a submarine costs up to £200,000 a day. Its cruise missiles cost £500,000 each. • The navy's two frigates in the Mediterranean – HMS Cumberland and HMS Westminster. Running costs about £90,000 a day. HMS Cumberland was diverted to Libya on its journey home to be scrapped, so every day it is there is above and beyond budget. Kas man liekas interesanti visā šajā jezgā, ir vairākas lietas. 1. 30 un vairāk gadus Kadafi <asiņainais režīms> nevienam pārāk netraucēja, par spīti tam, ka bija tur kaut kādas lietas ar uzspridzinātām lidmašīnām utt., NATO gaisa uzlidojumi konkrētiem objektiem. Visādi citādi - viss bija kedās un par nepieciešamību <steidzami un par katru cenu> nodabūt nost no varas Melno Pulkvedi neviens nerunāja. 2. Cik ātri tika pieņemts lēmums par koalīcijas spēku iejaukšanos. Pat Irākas @ 2003 iebrukums, pirms tas reāli notika, tika apzelēts teju vai pusgadu ar visu to, ka koalīcijas valstu valdības šajā jautājumā bija ±vienisprātis un atlika tikai PR darbības pārliecināt savu valstu iedzīvotājus, ka šis iebrukums patiešām ir attaisnojams, nepieciešams un nāks nabaga apspiestajiem irākiešiem par labu. Lībijas gadījumā nekā tāda nebija. 9K116 tā rezolūcija ir pēc numura 1973 nevis pieņemta 1973. gadā. Bet vispār tā ir liela avantūra atbalstīt nezināmus spēkus, no kuriem nav zināms ko sagaidīt. Rietumiem Arābu pavasaris bija pārsteigums un tagad tie cenšas glābt situāciju. Šī konflikta iznākums vai ASV vēl var uzskatīt par pasaules lielvaru vai arī šīs gods ir jāatdod Ķīnai. Papinsh raksta: 9K116 tā rezolūcija ir pēc numura 1973 nevis pieņemta 1973. gadā. Papinsh raksta: Bet vispār tā ir liela avantūra atbalstīt nezināmus spēkus, no kuriem nav zināms ko sagaidīt. Nu ja mēs neticam tik sarežģītām teorijām ka PSRS uzsāka karu nevis Vācija, tad kāpēc mums jātic ka visu inspirē ASV specdienests un NWO? Es šai sakarā gan domāju ka problēmas Arābu valstīs ir ilgas un padziļinātas un tautas spontāna pretestība ir iespējama. Protams visas revolūcijas inspirē nevis nabagi bet turīgie kas apvieno zemāko šķiru masas. Lielākā daļa revolūcijas inspirētāju bija vidusšķiras pārstāvji, Markss, Ļeņins. Noteikti ir tā ka šie līderi ietekmējās no rietumu piemēra. Bet vai ASV vajag darīt lietas ko tā nevar kontrolēt? Tas ir jautājums, reiz jau apgādājot Mudžahedus ar stingeriem ASV pamatīgi aprāvās, ja viņi tiešām tagad to pašu dara, tad aprausies atkal jo Musulmaņa daba nav prognozējama. Ir interesanti kāpēc Rietumnieki mēdz saredzēt lielāku ļaunumu savā vidū nekā austrumu valstīs kur to neviens neslēpj un atklāti izrāda. Laikam tā ir problēma ka liela daļa Rietumu kristīgajām vērtībām nemaz netic, bet austrumu vērtības redz kā kaut ko interesantu un satraucošu. Man arī patīk Ķīnas kultūra, bet apzinos briesmas ko šī valsts slēpj. Pēc vispārējās vienprātības informācijas avotu vidū, "zaļa armija" (KadafI) pametusi pozīcijas Lībijas austrumos, kā rezultātā Bengazi varai izdevies atgūt naftas ostas, līdz pat Sirtei, kas ir Kadafi dzimtā pilsēta. Šodien Sirti bombardēja koalīcijas aviācija (drausmīgais Kadafi noziegums). Ļoti reti redzēts militārais manevrs uz sestdienu un svētdienu pamest kaujas lauku. No otras puses, Turcija un Āfrikas savienība iestājusies par samierināšanas starpniekiem. Nez kas tur sanāks. Nu diez vai šis būs pareizs, jo nav jau sagatavota šāda pārņemšana, nav plānota Kadafi nogalināšana. atceramies kaut vai PSRS, kas parņema Afganistānu. Ātri un precīzi. Bahreinas attīstība norāda, ka ar šiem "demokrātiskajiem" protestu organizatoriem var vienoties. Un sekas šādai vienošanās ir tāda, ka demokrātiskais Bahreinas karalis, nu lietos savas armijas lidmašīnas, lai uzturētu no-fly zonu Lībijā. Protams, ka šī ziņa ir pilnīgi absurda, ja ņem vērā, ka tur šo zonu uztur Britu , ASV un Francijas elite. bet katrā gadījumā, tas liecina par Bahreinas uzticību (koalīcijai?). Otra lieta, kas akcentē mērķus ir Sīrija. Sīrijas drošības spēki bliez virsū Dienvidu neapmierinātajiem tiešā trāpījumā, bez kļūdām. Tā sakot, Kadafi, ir salīdzinošs jērs. Bet kur Kadafi ir īpašs, tad ar izlocīšanās no visādiem patronāžas vienošanās līgumiem - proti, uzticības apliecināšanai, teiksim Rietumiem. Un manuprāt, visā šī Lībijas kampaņa ir noderīga tikai vienam - "muskuļu demonstrēšanai" (tās sakot Arābu Hirosima). Tās aizsegā visticamāk iet kādas sarunas par "draudzību". Kāds ir dziļākais mērķis? Ir varianti - Palestīna, Irāna, OPEC uzmešana - tas jāgaida nākotnē. Papinsh raksta: Nu ja mēs neticam tik sarežģītām teorijām ka PSRS uzsāka karu nevis Vācija, tad kāpēc mums jātic ka visu inspirē ASV specdienests un NWO? Papinsh raksta: Es šai sakarā gan domāju ka problēmas Arābu valstīs ir ilgas un padziļinātas un tautas spontāna pretestība ir iespējama. 1. Kāpēc šādi pēkšņi notika vairākās valstīs uzreiz? 2. Kāpēc Rietumu koalīcija piepeši izrādījās tik norūpējies tieši par Lībiju? 4. Kāpēc līdzīgi protesti nenotiek, piemēram, Sudānā, kur, neapšaubāmi, problēmu ir vēl vairāk un tās sāpīgākas. Bet tur, odnako, nekādu protestu nav. Kāpēc tāda nekonsekvence? Papinsh raksta: Bet vai ASV vajag darīt lietas ko tā nevar kontrolēt? Tas ir jautājums, reiz jau apgādājot Mudžahedus ar stingeriem ASV pamatīgi aprāvās, ja viņi tiešām tagad to pašu dara, tad aprausies atkal jo Musulmaņa daba nav prognozējama. tas_pats_lv raksta: atceramies kaut vai PSRS, kas parņema Afganistānu. Ātri un precīzi. 2. Tāpēc ka tur ir nafta un pilsoņu karš naftas valstī nav izdevīgs. Taču ASV kā "demokrātijai" ir jāizvēlas smagākais ceļš un jāatbalsta nemiernieki. 3. Lībijā pastāv klanu sistēma un etniska nevienlīdzība. Klani kas ir pret Kadafi dzīvo Kirenaikas apgabalos, klani kas atbalsta Kadafi ir pretējā pusē. 4. Ja nezināji tad nesen Sudāna sadalījās divās valstīs, tur notika referendums un Dienvidsudāna nu ir neatkarīga valsts. Dienvidsudānas nēģerus arābu problēmas neuztrauc. 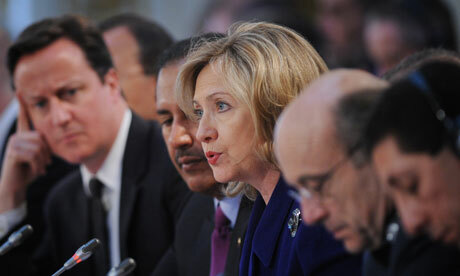 Coalition military action in Libya will continue until Muammar Gaddafi complies with the terms of United Nations security council resolution 1973, Hillary Clinton has told world leaders meeting in London. The move came amid mounting diplomatic and military pressure on Gaddafi as Britain tries to assemble a global consensus demanding he surrender power while intensifying air strikes against his forces. An international conference in London – including the UN, Arab states, the African Union, and more than 40 foreign ministers – will focus on co-ordinating assistance in the face of a possible humanitarian disaster and building a unified international front in condemnation of the Gaddafi regime and in support of Nato-led military action in Libya. "I can't say I know of active efforts to find him a place to go, but I would not say it has been ruled out," the official said. "The ICC has said it will ready to pursue the case, but there are also the rules of the ICC," he added, pointing out that some countries do not recognise the court's jurisdiction. David Cameron and Nicolas Sarkozy tried to ratchet up the pressure on Gaddafi, issuing a joint statement on the eve of the conference declaring his era over, and indicating that his lieutenants might escape prosecution if they abandoned him immediately. "We call on all his followers to leave him before it is too late," they said. Meanwhile Obama gave a televised speech to the American people in which he explained why the US was involved in the conflict, as a response to his domestic critics over the crisis. The US president increased the pressure on Gaddafi by saying it was imperative his rule be ended. "We continue to pursue the broader goal of a Libya that belongs not to a dictator but to its people," he said. "Gaddafi has not yet stepped down from power and until he does Libya will remain dangerous." He also used his speech to emphasise that strikes against Gaddafi's forces would continue even as American leadership of the campaign transferred to Nato tomorrow. "Our coalition will keep the pressure on Gaddafi's forces," he said. Meanwhile, with the Libyan regime's forces and rebels squared for a battle around Gaddafi's birthplace of Sirte, British planes taking part in the coalition campaign stepped up their bombardment. RAF Tornados hit 22 tanks, armoured vehicles and artillery pieces over the weekend, the Ministry of Defence said. Early Monday, they struck ammunition bunkers near Subha in southern Libya, according to Major General John Lorimer, the MoD's chief military spokesman. Defence officials said the higher tempo was the result of more intelligence surveillance and assessments from reconnaissance aircraft. Discord over the air strikes threatens to undermine the consensus the UK will attempt to construct at the Lancaster House conference. Russia denounced the air campaign, arguing it violated UN security council resolution 1973, which permitted "all necessary measures" to protect civilians. Foreign minister Sergei Lavrov said: "We consider that intervention by the coalition in what is essentially an internal civil war is not sanctioned." Turkey's prime minister, Recep Tayyip Erdogan, was also critical, and in a symbolic blow to the London conference, it emerged that Amr Moussa, the secretary general of the Arab League – whose support for military action was deemed crucial by Washington and its allies – would not be attending, sending a deputy instead. The joint statement issued by Cameron and the French president was intended in part to heal discord over the command of the air campaign and France's recognition of the Benghazi-based National Libyan Council. The rebels are not invited to the conference, but William Hague is expected to meet one of their leaders, Mahmoud Jibril. The shadow defence secretary, Jim Murphy, will warn today: "The bravery of the Libyan opposition is not in doubt. What is unclear is the motives of some, other than the removal of Gaddafi. As the opposition move westwards across Libya it is crucial that we better understand who they are and their wider ambitions." Britain agrees with the United States that the UN has provided a legal basis to supply arms to rebel forces in Libya in limited circumstances, David Cameron and William Hague have told the House of Commonstoday. But the prime minister and the foreign secretary indicated Britain was in no rush to ship arms to the rebels as they cautioned that ministers would act with "extreme care" before making any decision. 5.00pm: Breaking news from Chris McGreal on the ground in Libya. Brega has fallen to pro-Gaddafi forces. He phones to say they are now advancing towards Ajdabiya and the rebels are retreating from there. That returns the situation to where it was on Saturday - before the rebels pushed forward with the help of coalition air strikes. Katrā gadījumā Lielbritānija ir izģērbusies, pēc konferences Londonā, kurā Kadafi pārstāvji paziņoja, ka Bengazī valdība pārstāv tikai Alkaīdas kaujiniekus. Atgādina Staļina iebrukumu Somijā. The regime of Muammar Gaddafi has initiated a concerted effort to open lines of communication with western governments in an attempt to bring the conflict in the country to an end. Libya's former prime minister, Abdul Ati al-Obeidi, told Channel 4: "We are trying to talk to the British, the French and the Americans to stop the killing of people. We are trying to find a mutual solution." Although the regime last night rejected a rebel offer of a ceasefire if Gaddafi withdraws his military from Libya's cities and permits peaceful protests, senior British sources said the Gaddafi government was open to dialogue. "If people on the Gaddafi side want to have a conversation, we are happy to talk," one said. "But we will deliver a clear and consistent message: Gaddafi has to go, and there has to be a better future for Libya." Ļoti inetersants informācijas veids, ar mājienu, ka tas ir Kadafi karš, ko viņš ved - nevis rietumu agresija, kuru viņa var pārtraukt jebkurā brīdi, tā pat kā uzsāka. The United States will begin withdrawing its combat jets, missile ships and submarines from the operation to secure the no-fly zone over Libya, as the conflict appears to be descending into a stalemate between the two opposing sides. The move, announced by senior US military officials, comes amid increasing vocal scepticism from members of President Barack Obama's administration over the capability and representative nature of the Libyan opposition. Pēc pēdējā gadījuma, kad NATO līdmašīna iznīcināja monarhistu tanku. Monarhisti saprotot, ka bez Nato sauzemes iebrukuma viņiem ies slikti, sālka čīkstēt. The chants of the demonstrators in Benghazi and among furious rebel fighters on Libya's frontline reflected the sudden shift in mood. "Where is Nato?" demanded the same people who only days earlier were waving French flags and shouting "Viva David Cameron". But behind the growing anger in revolutionary Libya over what is seen as a retreat by the West from air strikes against Muammar Gaddafi's forces – a fury compounded by two botched Nato raids that killed rebel fighters – there was a second question: where are our leaders? Nato's failure to use its air power to reverse days of military setbacks for the rebels prompted a collapse in confidence in the West's intentions among Gaddafi's foes. Conspiracy theories flew. The West wants a divided Libya so it can control the oil, said some. Turkey, a Nato member, is vetoing air strikes because it supports Gaddafi, said others. Nato denied it was scaling back attacks and explained it faced new challenges in striking Gaddafi's forces now that they have switched from relying on tanks and heavy armour in favour of smaller fighting units in pick-up trucks that are harder to hit. Not many in the liberated areas of Libya were interested. They were angry – and wanted their leaders to tell the West. But the revolution's self-appointed chiefs in the interim national council were nowhere to be seen. Eventually it took the leader of the rebels' armed wing, Abdul Fattah Younis, to voice the anger. "Nato is moving very slowly, allowing Gaddafi forces to advance," he said. "Nato has become our problem." The incident highlighted the virtual invisibility of the revolutionary administration to the ordinary people it claims to lead. That was not much of a problem when the uprising appeared to be advancing. But recent setbacks have shaken confidence and raised concerns that Libya might be facing an extended civil war or division, which means divided families among other things. Nu re, esam nodzīvojušie Lībijas karā līdz situācijai, ka monarhistiskie nemiernieki ir traucēklis mieram. BENGHAZI, Libya, April 16 (Xinhua) -- Libya's rebel forces, led by the newly-formed Transitional National Council (TNC), are advancing westward and fighting back bitterly with the government forces, town by town. The rebels, backed by NATO airstrikes, have arrived in the east of the oil town of Brega to fight a tug of war with forces loyal to Libyan leader Muammar Gaddafi. Battles also continued in some other places in the country, including the western city Misrata and Gaddafi's hometown Sirte. But the NATO countries have split over the scope of the alliance's military campaign. NATO Secretary General Anders Fogh Rasmussen reiterated on Friday that there was no "purely military solution" to the crisis. Reaching ceasefire with the pro-Gaddafi forces or not, the TNC, which played some role as an "interim government" of rebels, is facing pressures from two fronts - international and domestic. An African Union (AU) delegation last Sunday arrived in Tripoli, capital of Libya, to mediate a ceasefire deal for the country. The delegation Monday traveled to Benghazi, stronghold of rebels in eastern Libya. Mull Sebujja, Uganda's ambassador to Ethiopia, said that, under the international law, the sole legitimate government of Libya currently is the Gaddafi government. AU supported the Libyan people's movement to win freedom, but it preferred to see the opposition win its rights and benefits in open and free elections, instead of resorting to force, said Sebujja. However, Christopher Prentice, who traveled with the AU delegation to Banghazi, said that the Gaddafi government has lost its legitimacy as it attacked civilians. The delegation said that Gaddafi had accepted the roadmap initiated by the AU. The TNC had talks with the AU delegation for nearly four hours, apparently under pressures from the AU and Western countries and domestic chaos. The TNC rejected the AU roadmap for ceasefire, saying it did not include the ouster of Gaddafi. The council mainly relies on the support of residents in eastern Libya, who strongly wanted Gaddafi to step down. If the council accepted the AU deal, it would face a risk of collapse. The 30-member TNC is chaired by Mustafa Abdul-Jalil, a former justice minister who split with Gaddafi. The Benghazi-based council supervises a military committee and a small "emergency government" which has established nine "small ministries," including "the foreign ministry," "the defence ministry" and "the interior ministry" to handle emergencies in such fields as security and foreign affairs in eastern Libya, rebels said. The TNC now also governs some eastern cities like Benghazi, Albyada, Darnah and Tubrug through the city councils, some members of which are ex-officials from the Gaddafi government, rebels said. Libyan rebels currently also control some key towns and ports to export oil. Rebel leader Abdul-Jalil has said that the Libya opposition will stick to the international treaties and agreements signed by the Libyan government and protect foreign citizens and companies and their investment in Libya. The TNC is even drafting a new constitution. However, rebels said that they lacked weapons and battlefield experiences and had difficulties in resisting offensives launched by Gaddafi forces. Libya's rebel forces mainly consist of small loose groups. Each group normally embraces a dozen of fighters riding on five or six trucks and carrying AK-47 rifles, machine guns, anti-aircraft weapons and rockets. They have few heavy weapons like tanks. Rebels are largely residents in eastern Libya who are hastily called for battle. Rebels have set up training camps for new soldiers and weapon factories in Benghazi and they are stepping up their "soldier-producing" campaigns to make up for their shortage of soldiers. Rebels enjoy voluntary support from residents in eastern Libya, which is the key for their survival. In Benghazi and its nearby areas, local residents have set up at least five relief stations to provide food for rebel fighters and refugees who fled from the fighting near Aljidabya. Rebels and residents have set up teams in Benghazi to provide free oil as the fuel price at gas stations in the city were seen dropping, instead of rising. Pro- and anti-government fighters are continuing their battles in major towns across the country and NATO is still going on with its airstrikes. NATO on Saturday again hit targets in Sirte, some 600 km east of the capital Tripoli, after similar raids in the previous day. Meanwhile, countries like Spain and the United States, which have withdrawn some 50 warplanes from Libya and transferred into a supporting role since handing over control of the mission to NATO, were turning a cold shoulder to France and Britain's pressing call to make a more robust contribution to the joint military actions in Libya. Earlier in the week, NATO members were already in discord in the first meeting of the Contact Group on Libya on whether the international community could provide the rebel army with arms. Ceasefire or not, rebel forces in Libya, which suffered a prolonged conflict, have to make a choice. Situācija tur iegājusi strupceļā, jo abas puses nevar vienu otru ātri uzvarēt. Kadafi spēki ir viltīgi un nomainījuši uniformas un tehniku, lai būtu līdzīgi nemiernieku spēkiem. Tur jau arī gadījums, kad NATO iznīcināja nemiernieku tanku kolonnu, ko tie bija sagrābuši. Kā gan var atšķirt kuram tie tanki un lidmašīnas pieder? Bet vispārēji "arābu pavasaris" pamazām beidzas. Ēģiptē armija jau šāvusi uz pūli, kas nozīmē tautas piečakarēšanu, jo tieši armija jau nogāza Mubaraku. Mubaraks gan ir arestēts tautai par prieku, bet jāšaubās ka armija turpmāk neatlaidīs grožus. Pat ja būs jauna konstitūcija ar parlamentu armija saglabās pēdējo vārdu. Tas varbūt labi tad varbūt tā piebremzēs Musulmaņu brālību. Bet briest jauns konflikts Tuvajos Austrumos, starp Izraēlu un Hamas. Hamas atkal šauj raķetes un Izraēla atbild pretī. Man zināmi cilvēki no Izraēlas saka ka vajag sākt tūlītēju uzbrukumu Gazai, kamēr Irānai nav bumbas un nav pasludināta Palestīnas neatkarība, kas var notikt nākošajos mēnešos. Man šitie kari sākot 2001. gada atgādina 20. gs. 30. gadus, kas notika daudzi konflikti visās pasaules malās, kas lēnām nobrieda līdz pasaules karam. Papinsh raksta: Situācija tur iegājusi strupceļā, jo abas puses nevar vienu otru ātri uzvarēt. Kadafi spēki ir viltīgi un nomainījuši uniformas un tehniku, lai būtu līdzīgi nemiernieku spēkiem. Tur jau arī gadījums, kad NATO iznīcināja nemiernieku tanku kolonnu, ko tie bija sagrābuši. Kā gan var atšķirt kuram tie tanki un lidmašīnas pieder? Galu galā, viņus takšu atbrīvo! Nekādas tanku kolonas Bengazī traču cēlājiem nav nekad bijis - 1 tanks! Un viena lidmašīna, kuru viņi notrieca paši, ar pleca iekārtu. Bengāzī armija sastāv pamatā no baltiem Nisan pikabiem, kas braukā pa piejūras šoseju. Bet viņiem ir uzradušies Seržanti(ārzemnieki, jo kaujās neiet) - spilgti zaļās formās, kas viņus mēģina trenēt, no Afganistānas mēs zinām, ko tas nozīmē. Un varenākais militārais spēks Bengazī pusei bija franču groud-ground raķešu kompleksi, ko viņai piegādāja Katāra pa taisno no Francijas . Man nav skaidrs, kā raķete var nedefinēt , kā aizsardzības līdzekli, nevsi agresijas. Es vispār nesaprotu, ko Rietumu populisti tiks no šīs krīzes ārā, jo tagad Bengazi un Austrumu Lībija būs jābaro rietumu varoņiem, ne velti ASV notinās, lai taupītu līdzekļus budžetam. Tad kad Kadafi bija ar mieru braukt prom, viņam draudēja ar starptautisko kriminālo tiesu, tagad, viņam pat nav iemesla kaut kur braukt, pieprasa lai viņš, "go away". Vai šī konflikta pamatdoma, ir pasauli pārvalda idioti? Papinsh raksta: Bet vispārēji "arābu pavasaris" pamazām beidzas. Ēģiptē armija jau šāvusi uz pūli, kas nozīmē tautas piečakarēšanu, jo tieši armija jau nogāza Mubaraku. Mubaraks gan ir arestēts tautai par prieku, bet jāšaubās ka armija turpmāk neatlaidīs grožus. Pat ja būs jauna konstitūcija ar parlamentu armija saglabās pēdējo vārdu. Tas varbūt labi tad varbūt tā piebremzēs Musulmaņu brālību. Bet vai tad "tautai" kaut kas tika solīts? Jo manuprāt nemieri izcēlās uz ekonomiskiem pamatiem, - mēs negribam dzīvot Latvijā! Mēs to vairs nevaram paciest - nost Mubaraku! Un lūdzu, Mubaraks vairs nav! Revolūcija ir veiksmīga. Urā! Bet kamieļi no tā vairāk nav palikuši.